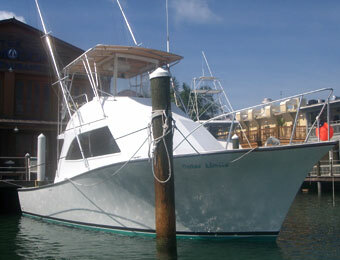 Key West Charter Boat "Outer Limits"
Constructed in 2000, the OUTER LIMITS is a brand new 42ft. Custom Sport fishing vessel. 128 Sq. FT. Cockpit featuring 130lb Pompanette Marlin Chair, Rocket Launchers, 16 Rod Holders, and 50 Gallon Live Well. Inside the air conditioned cabin there are wrap around couches and plenty of room to move around. Blister 40mph top speed delivered by twin 430C Cummins Turbo Diesels and 860 horsepower. We provide more time on the fishing ground and access to remote pristine locations. Bose Surround Sound Stereo, DVD/CD Player, microwave, refrigerator and freezer. The cabin is air conditioned for your comfort. There is a head (bathroom) on board with toilet and washbasin. 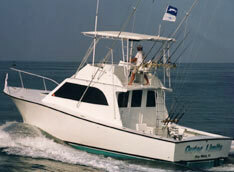 Commercial state of the art electronics and custom fishing tackle provide a first class Key West fishing adventure.